A national memorial service is held at St Paul's Cathedral in London, to remember the 52 people killed in the 7 July bombings. Families of victims, survivors and emergency service workers are joined by dignitaries including the Queen and Tony Blair. In his sermon the Archbishop of Canterbury Dr Rowan Williams says: "We are here grieving...because those who so pointlessly and terribly died were, each one of them, precious, non-replaceable." Imran Yaqub Patel, 27, who was arrested in Dewsbury, West Yorkshire, after claiming he was involved with the 7 July bombers, is charged with causing "the wasteful employment of the police" by lying to a reporter. Magistrates in Leeds bail him until 25 November. A 27-year-old man is arrested in Dewsbury, West Yorkshire after a tip-off from the News of the World. Police question him on suspicion of the commission, preparation or instigation of acts of terrorism and search two residential properties in Dewsbury. The Criminal Injuries Compensation Authority confirms it has sent out the first payments to victims of the 7 July bombings. A dedicated team is dealing with the first interim payments, for bereaved relatives and the severely injured. 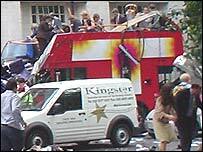 A new bus called Spirit of London is unveiled to replace the one destroyed in the 7 July bomb blast. Mayor Ken Livingstone said the bus was in tribute to the victims and hoped George Psaradakis, the driver on the day it was bombed, would take the wheel. A new CCTV image of one of the 7 July London bombers is released as police try to shed more light on the attacker's movements before he detonated his device. Hasib Hussain, who bombed the No 30 bus, killing 13 people, is shown leaving a Boots chemist shop in King's Cross station at 0900 BST on the day of the attack. The family of Brazilian Jean Charles de Menezes are shown the flat he was living in when police mistook him for a suicide bomber. They also visit Stockwell Tube station, where he was killed. Mr Menezes' mother repeats her call for Met Police chief Sir Ian Blair to resign. Jean Charles de Menezes' parents and five other relatives arrive in Britain for a two-week visit, paid for by Scotland Yard. The Brazilian electrician was shot dead on 22 July by police, who mistook him for a suicide bomber. Mr Menezes' mother tells reporters at Heathrow Airport that she is searching for justice and wants the police to be punished for his death. His brother says the family wants to meet senior police. Victims of the 7 July London bombings will start to receive interim payments within 10 days, the Criminal Injuries Compensation Authority confirms. It follows a promise from Prime Minister Tony Blair on Sunday that he would investigate reports survivors had yet to receive any help. Some survivors of the 7 July attacks have expressed anguish at delays in government compensation. Payments of various amounts are available to the injured and families of those killed in the attacks. Extradited suspect Hussain Osman, 27, also known as Hamdi Issac, is remanded in custody after appearing before Bow Street magistrates, sitting at Belmarsh prison. Ethiopian-born Mr Osman will appear at the Old Bailey in London on 8 December alongside three other men, who also face the same charges. Hussain Osman, 27, also known as Hamdi Issac, leaves prison in Rome and is extradited to the UK over the failed 21 July attacks. Mr Osman is formally arrested by anti-terror officers at RAF Northolt. He is later charged with attempted murder, conspiracy to murder and committing explosives offences. 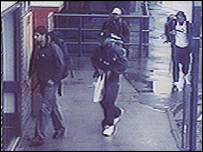 The images show three of the bombers entering Luton station, before travelling to King's Cross station where they are also pictured. The three, Mohammad Sidique Khan, Shehzad Tanweer and Germaine Lindsay, were conducting a carefully planned reconnaissance exercise, police say. Al-Qaeda's deputy leader says for the first time the group carried out the 7 July London bombings. In a videotaped message aired on Arab television station al-Jazeera, Ayman al-Zawahri said al-Qaeda had the "honour" of carrying out the attacks. Osama Bin Laden's lieutenant had previously praised the bombings and blamed them on the UK's foreign policy. The court hearing of four men accused of the failed 21 July London Tube bombings is postponed. Ibrahim Muktar Said, 27, Ramzi Mohamed, 23, Manfo Kwaku Asiedu, 32, and Yassin Omar, 24, are charged with conspiracy to murder and explosives offences. They were due to appear at the Old Bailey on 14 November, but the date has been changed to 8 December, after an application by prosecutors. Hussain Osman, who is wanted in connection with the Shepherd's Bush attack on 21 July, loses his appeal in Italy's highest court against extradition to the UK. Mr Osman, also known as Hamdi Issac, is expected to be transferred to Britain within the next 10 days, a UK government lawyer says. Al-Jazeera television airs video of suicide bomber Mohammad Sidique Khan where he explains his motives. The message from Khan, 30, was recorded on the same video as a message from al-Qaeda's Ayman al-Zawahri. The bomber said the public were responsible for the actions of the government and said until there was an end to the "bombing, gassing, imprisonment and torture of my people we will not stop this fight". One of the 7 July London bombers called the other three suicide attackers before his device on the No 30 bus went off, the BBC learns. Hasib Hussain, 18, tried to contact his three accomplices on his mobile phone before killing himself and 13 other people. Meanwhile the Independent Police Complaints Commission says it is "confident" it has all the CCTV footage available on the shooting of Jean Charles de Menezes at Stockwell Tube station. IPPC head Nick Hardwick said some of it would prove crucial to the probe. 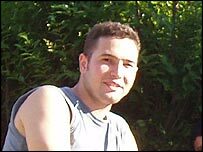 The Independent Police Complaints Commission says it will complete its inquiry into the shooting of Jean Charles de Menezes by Christmas. An inquest into the death of the Brazilian, shot at Stockwell station after he was mistaken for a suicide bomber, is adjourned until 23 February. An Italian court approves the extradition within 35 days of a suspect in the failed bomb attacks in London on 21 July. Hussain Osman, who is wanted in connection with the Shepherd's Bush attack and is also known as Hamdi Issac, will fight the decision at the Italian supreme court, his lawyers say. It would be "very, very surprising" if the two sets of London bombings in July were not connected, Home Secretary Charles Clarke tells the BBC. But Mr Clarke said there was "not a direct linkage formally established". A memorial service for the victims of the London bombings is to be held at St Paul's Cathedral in London on 1 November, the government announces. Also, cleric Abu Qatada is expected to be deported to Jordan next week. Ten foreign nationals who the Home Office say pose a threat to national security have been detained in the UK, pending deportation. The Jordanian cleric Abu Qatada and at least two others previously detained in Belmarsh Prison without charge are believed to be among those arrested. A further 10 people accused of withholding information about those suspected of the failed 21 July bomb attacks on London are remanded in custody when they appeared in court. Four of them face new charges of assisting a person to evade arrest. A man is charged in connection with the 21 July attempted bomb attacks in London. Abdul Sharif, 28, is charged with failing to disclose information about prime suspect Hussain Osman, who is alleged to have tried to blow up a Tube train near Shepherd's Bush station on July 21. Security is to be stepped up at all 20 Premiership football grounds in the wake of the attacks. The police chief responsible for the City of London says it is only a matter of time before the capital's financial heartland is attacked by terrorists. An Egyptian chemist released after questioning in Cairo says he is wary of returning to his home in Leeds as he fears people will not realise he has been cleared of having any links to the 7 July bombings. Judges could risk Britain's security by opposing new proposed anti-terror laws, writes Tory leader Michael Howard in the Daily Telegraph. British detectives question for the first time a man held in Italy on suspicion of trying to blow up a Tube train in London on 21 July. 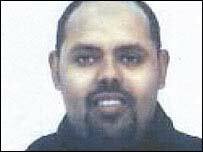 Hussain Osman, also known as Hamdi Issac, is facing extradition to the UK. An Egyptian chemist held in Cairo after the 7 July London bombs is freed after being cleared of being connected to the attacks. Four men charged with planning the failed 21 July London attacks are remanded in custody by magistrates. Ibrahim Muktar Said, Yassin Hassan Omar, Ramzi Mohamed and Manfo Kwaku Asiedu will appear again at the Old Bailey on 14 November. Three others - Siraj Yassin Abdullah Ali, Wharbi Mohammed and Asias Girma - appeared charged with assisting in evading arrest and were remanded until 11 August. Two of the men named as bombing suspects are charged with conspiracy to murder people in the 21 July London attacks. Ibrahim Muktar Said, 27, and Ramzi Mohamed, 23, are charged with conspiracy to murder people in the attempted attacks. They are also accused of attempted murder, conspiracy to cause explosions and possession of an explosive substance. Mr Said, of Stoke Newington, north London, is suspected of the failed Hackney bus bombing and Mr Mohamed has been accused of the attempted Oval Tube bombing. Another man, Manfo Kwaku Asiedu, of Finsbury Park, north London, is charged with conspiracy to murder and conspiracy to cause explosions. The charges relate to an unexploded device found at Little Wormwood Scrubs park, in west London. Two other men - Siraj Yassin Abdullah Ali and Wharbi Mohammed - are charged with assisting in evading arrest. Suspected failed 21 July bomber Yassin Hassan Omar is charged with conspiracy to murder London transport passengers and possessing an explosive substance. Mr Omar, who has been accused of trying to blow up a train between Oxford Circus and Warren Street, is also charged with attempting to murder passengers and conspiracy to cause explosions on 21 July. Scotland Yard is to send a detective to Rome to question bombing suspect Hussain Osman, his lawyer said. The officer will ask him about the failed attack on a Tube train near Shepherd's Bush in west London on 21 July. Meanwhile, the Bank of England freezes the assets of Mr Osman, 27, and the three other prime suspects in the 21 July failed bomb attacks. Three men charged in connection with the 21 July failed bombs are remanded in custody until 11 August after a brief hearing in London. The men are Shadi Sami Abdel Gadir, 22, Omar Nagmeloin Almagboul, 20, and Mohamed Kabashi, 23, all from Brighton. They are charged with failing to disclose information to police investigating the attempted attacks on London's transport network. Six people charged under the Terrorism Act with failing to disclose information that could have helped police investigating the 21 July attacks. They include suspected bomber Hussain Osman's wife, Yeshiemebet Girma, 28, and her sister Mulumebet Girma, 21, who appear at Bow Street Magistrates' Court and are remanded in custody. Shadi Sami Abdel Gadir, 22, Omar Nagmeloin Almagboul, 20, and Mohamed Kabashi, 23, who were all arrested in Brighton on 31 July, are also charged. Earlier in the day, police confirm two further arrests as part of the inquiry into the failed 21 July attacks. Scotland Yard says a man was arrested in Finchley, north London, on Tuesday, and a woman detained in Stockwell, south London, the following day. They are held under the Terrorism Act. Osama Bin Laden's lieutenant Ayman al-Zawahri warns London will face more attacks because of Prime Minister Tony Blair's foreign policy decisions. His makes his comments in a videotape, broadcast on Arab satellite channel al-Jazeera. In London, Ismael Abdurahman is remanded in custody at his first court appearance over charges relating to the 21 July. And the authorities in Rome announce bomb suspect Hussain Osman will face an extradition hearing on 17 August. Ismael Abdurahman, 23, from Kennington, becomes the first person to be charged over the 21 July attacks. Police say he is charged with not reporting information that could have led to the apprehension of someone involved in terrorism. It is understood the charge relates to the Shepherd's Bush bombing which Hussain Osman, held in Italy, is suspected of carrying out. Meanwhile, a police leader warns the safety of London could be "fatally compromised" if police officers are not given time to rest and recuperate. It is also revealed that work on some murder investigations is being scaled back during the continuing terror alert. And it is confirmed the families of those killed in the London terror attacks will be eligible for automatic bereavement compensation of £11,000. A meeting intended to improve community relations and root out extremists is held between Home Office Minister Hazel Blears and Muslim leaders. The talks, in Oldham, are the first of a series across the country offering the chance to raise concerns prompted by the London bombings. Councillors, police and MPs take part in the discussions. Meanwhile, the Hammersmith and City Tube line is reopened for the first time since the 7 July bombings. Four people arrested over the bombings are released without charge, bringing the number still held in custody in the UK to 17 out of 37 arrests. Bomb suspect Hussain Osman is charged by the Italian authorities with association with the aim of international terrorism and with possessing false documents. The move allows the authorities to continue holding Mr Osman - also known as Hamdi Issac - and is separate from Britain's attempt to extradite him. Italian investigators say they believe Mr Osman has no links with international terrorist organisations. In the UK, two men are arrested in connection with the 21 July failed attacks after three raids on separate addresses in south London. A second brother of Hussain Osman's is arrested, according to Italian media reports. ANSA news agency claims Fati Isaac was detained in Brescia, northern Italy. In the UK, seven more people are arrested after two properties are raided by police in Sussex. Hussain Osman faces an extradition hearing in Rome after his arrest there on 29 July. Italian police reveal how they tracked the 27-year-old, who is also being named as Hamdi Issac, from London to Paris and then on to Italy. They traced calls made from a mobile phone to his brother, named by the Italian media as Remzi Isaac, who is also detained, and his father in Brescia, northern Italy. Italian authorities say he is an Ethiopian-born UK citizen, not Somali-born as originally reported. Three men are arrested in raids in London and another in Rome. One identifies himself to police as Ibrahim Muktar Said - a suspect for the failed bombing of a Number 26 bus on 21 July. He is arrested after police storm Dalgarno Gardens, on the Peabody estate in North Kensington. A second man arrested at the same flat names himself as Ramzi Mohamed. He is wanted in connection with the attempted Oval Tube station attack. A third man, who has not yet been named, is arrested in Tavistock Crescent, Notting Hill, in London. Police are investigating whether he is linked to a device found in west London last week. Later on Friday a fourth man - Hussain Osman - is arrested in Rome. He is suspected of attempting to bomb a Tube train near Shepherd's Bush. Police believe all four of the 21 July bomb suspects are now in custody. That includes a man arrested in Birmingham on Wednesday, Yassin Hassan Omar, a suspect in the attempted Warren Street Tube attack. During the afternoon, police also arrest two women reportedly pinned to the ground in a queue at Liverpool Street station. Meanwhile West Midlands Police issue a statement defending their use of a Taser stun gun in the arrest of bombing suspect Yassin Hassan Omar in Birmingham. Edgware Road station opens for the first time since the 7 July bomb attacks. Anti-terror police arrest nine men in raids on two addresses in Tooting, south London. 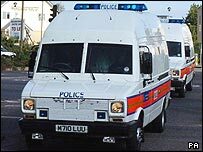 They are arrested under the Terrorism Act 2000 and taken to a central London police station for questioning, but it is not thought any of the suspected bombers is among them. Police sources say later no explosives were found in the raids. Meanwhile British Transport Police confirm they are on high alert as of Thursday morning, and will maintain an increased presence on the UK's transport system. Metropolitan Police Commissioner Sir Ian Blair says he is confident the bombers will be caught, but the failure of the 21 July attacks did not mean a weakening of their capability or resolve. He acknowledges it is possible those at large "will strike again". Later, speaking on a special Questions of Security programme on BBC One, Sir Ian says West Midlands Police took an "incredible risk" using a stun gun during the arrest of suspected suicide bomber Yasin Hassan Omar in Birmingham. Police investigating the 21 July bombings arrest four men at two addresses in Birmingham. It later emerges that one of the men, who was wearing a rucksack, was held after being shot with a Taser stun gun. He was found in the Small Heath area of the city. The Metropolitan Police confirm the man is Yassin Hassan Omar, wanted as a suspect in the Warren Street attempted bombing on 21 July. They also release a new picture of the man believed tried to set off a bomb on the Shepherd's Bush Tube train. Three women are arrested when police raid a ground floor flat at Blair House, 200 yards from Stockwell Tube station in south London. Police say the women were arrested on suspicion of harbouring offenders. Meanwhile, a man who was about to board a plane bound for Nimes in France is detained under the Terrorism Act at Luton Airport. He has since been released. British Prime Minister Tony Blair meets his Spanish counterpart Jose Luis Rodriguez Zapatero and welcomes a proposal to create an "alliance of civilisations" between Western and Muslim countries in the fight against terror. Two men arrested under the Prevention of Terrorism Act at Grantham railway station in Lincolnshire are released without charge. Police find a large quantity of "possible" explosives in a flat in New Southgate, north London, where bomb suspect Yassin Hassan Omar lived. They also cordon off a white VW Golf in East Finchley. Security sources say it is believed to have been used by one of the suspected would-be bombers on 21 July. Police are given extra time to question a man arrested in Tulse Hill, south London, on 23 July. He could now be held until 27 July, along with two men arrested in Stockwell on 22 July. Police arrest two men under the Prevention of Terrorism Act at Grantham railway station as they travel from Newcastle to London King's Cross. Meanwhile, the family of Ibrahim Muktar Said issue a statement expressing their shock that he has been named a suspect in the attempted bombing of the No 26 bus in Hackney Road on 21 July. Police say the device found at Little Wormwood Scrubs, west London, was a bomb similar to those used by the 21 July attackers, prompting speculation a fifth bomber may still be at large. They release details of the plastic food containers used for all five devices. They also name two of the suspected failed bombers as Ibrahim Muktar Said, 27, also known as Muktar Mohammed Said, and Yassin Hassan Omar, 24. Said is being linked to the attempted bombing of a Number 26 bus and Omar to an attack on the Tube between Oxford Circus and Warren Street. Armed officers raid a property in Ladderswood Way, New Southgate, north London, which Ibrahim is thought to have visited recently. Police also reveal that two more people have been arrested, taking the total held to five. Police carry out a controlled explosion on the suspicious package found in Little Wormwood Scrubs. Police are granted extra time to question the two men arrested in Stockwell and reveal they have arrested a third man under the Terrorism Act, in Tulse Hill, south London. Families of the victims of the 7 July attacks visit the scenes to pay tribute to their loved ones. The man shot dead at Stockwell Tube is not connected to the 21 July attacks, police say. They name him as Jean Charles de Menezes, 27, a Brazilian working as an electrician in London. 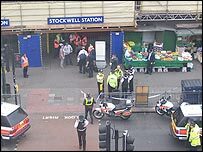 Stockwell and Warren Street stations reopen and the train on which a bomb failed to detonate properly at Shepherd's Bush station is moved. A second man is arrested in Stockwell, south London and officers raid a flat in Streatham Hill, also in south London. Police say a suspicious package found in bushes at Little Wormwood Scrubs, west London, may be linked to the attacks. A possible link between those behind the 21 July London attacks and a white-water rafting course attended by two of the 7 July bombers in north Wales is investigated. A man is shot dead by armed officers at Stockwell Tube station as police continued to hunt four would-be bombers. 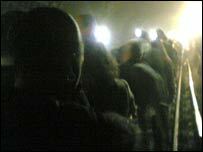 Passengers are evacuated from the Northern Line station in south London. Among them is Mark Whitby, who tells BBC News a man of Asian appearance was shot five times by "plain-clothes police officers" with a handgun. "I saw the gun being fired five times into the guy - he is dead," he says. Police arrest a man in Stockwell in connection with Thursday's failed attacks. London's transport network is again plunged into chaos with stations cleared after attempted bombings on Tube trains at Oval, Warren Street and Shepherd's Bush Underground stations and on a number 26 bus in Bethnal Green. The devices only partially explode, but Met Police Sir Ian Blair says they were designed to kill. No-one is injured in the incidents but they cause disruption on three Tube lines and around stations across the capital. A massive hunt begins for the bombers who fled when their bombs failed to explode properly. Several people are arrested in Pakistan, the country's High Commissioner to the UK confirms. Maleeha Lodhi tells BBC Radio 4's Today Programme: "A number of people have been taken in for questioning because obviously we want to make sure we get to the bottom of this as much as you do." The train carriage in which seven people died at Edgware Road station is removed from the track. A Leeds chemistry student, arrested in Cairo as part of the investigation, has nothing to do with the bombing, the Egyptian government says. Magdi Mahmoud al-Nashar, 33, was detained by Egyptian police on the request of the British government on 15 July. But an interior ministry report "made clear there was no link between Magdi al-Nashar and al-Qaeda or the bombings", a government spokesman says. Pakistani officials confirm three of the four London suicide bombers visited Pakistan last year. Mohammad Sidique Khan and Shehzad Tanweer arrived and left together, and spent three months there. Hasib Hussain flew in last July for an unknown period. The British Muslim Forum issues a religious decree - or fatwa - offering condolences for the attacks. The fatwa states that Islam condemns violence and forbids suicide bombings, and is to be read at mosques on 22 July. Police release a CCTV image of the four London bombers together at Luton station as they set off on their way to London. It also emerges that Edgware Road bomber Khan was investigated by MI5 last year but not deemed a threat. Khan was subject to a routine assessment because of an indirect connection to an alleged terror plot. The families of three of the bombers release statements describing their shock at their relatives' involvement. The death toll rises to 56, including the four bombers. The death toll rises to 55 overall, a figure which includes the four bombers. Egyptian chemistry student Magdi Mahmoud al-Nashar, 33, who had been sought by police in connection with the blast, is arrested in Cairo. The 33-year-old Leeds University chemistry PhD student denies any link to the bombings. Police continue to search homes in Buckinghamshire and Leeds, including one linked to Mr al-Nashar. A week on, a two-minute silence is held in memory of victims. Police sources believe the fourth bomber was Jamaican-born Lindsey Germaine, of Bucks, thought to have carried out the King's Cross attack. Scotland Yard releases an image of bus bomber Hussain, caught on CCTV as he went through Luton station on his way to King's Cross. 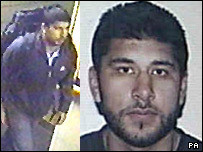 Police continue to hunt for a fifth man linked to the bombings who they say left the UK before they took place. Two of the bombers are named by police as Shehzad Tanweer, 22, of Beeston, Leeds, and Hasib Mir Hussain, 18, also of Leeds. 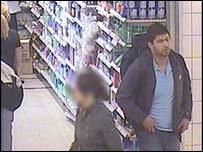 Tanweer is thought to be responsible for the Liverpool Street blast and Hussain the Tavistock Square. A third, Mohammed Sidique Khan, 30, of Beeston, linked to the Edgware Road attack, is named by newspapers. The fourth bomber's identity is not yet known. Anti-terror police also raid a house in Aylesbury, Bucks. Detectives say the bombings were carried out by four British-born men in what are possibly the country's first suicide attacks. Security sources say at least three of the men are dead after belongings were found at the scenes. The details emerge as explosives are found in Leeds and Luton after a series of raids. The first victim of the London bombings is named as the confirmed number of dead reaches 52. Police appeal to the public to hand over mobile phone images or photographs taken after the attacks. Sixty-five people remain in hospitals, many having had operations after losing limbs and suffering burns. The three Tube train bombs exploded within 50 seconds of each other, at about 0850 BST, police say. It was previously thought they had taken place over a longer time period. The bus bombing took place at 0947 BST, it is also revealed. Sir Ian Blair says there is "absolutely nothing" to suggest the attacks were the work of a suicide bomber or "to rule it out". The Met Commissioner says police have an "implacable resolve" to track down those responsible for the bombings. Relatives search for loved ones who may have been caught in the attacks. Forty-nine people are confirmed dead, but Sir Ian says efforts to recover bodies from the wreckage of the King's Cross Tube train continue. A series of co-ordinated bomb attacks towards the end of the morning rush hour cause devastation on London's transport network. Bombs explode on three Tube trains just outside Liverpool Street, Edgware Road and King's Cross stations. Another explosion goes off on a packed number 30 double-decker bus in Tavistock Square. The known death toll at the end of the first day is 37 with more than 700 injured. Foreign Secretary Jack Straw says the bombings have "the hallmarks of an al-Qaeda-related attack".